Fresh seafood more than compensates for this beachside cafeteria’s plastic chairs and long queue. Choose from shrimp or fried fish and order the fresh paratha (if it’s available that day) instead of rice. Inspired by Japanese izakaya dining, this restaurant does Asian-fusion fine dining at its best. Think Korean-influenced spicy beef tenderloin with chili and sesame or Japanese-inspired miso marinated black cod in hoba leaf. Satisfy your sugar craving with the vibrant yuzu tart, served with soymilk ice cream and mandarin blood orange compote. A graffiti-clad, market-style interior greets visitors at this Levantine street food stop. Order the shawarma (juicy with just enough garlic and so tasty it sells out before evening), foul (mixed bean stew) or fattoush with pomegranate for a sweet crunch. If you’re in the mood for a stiff drink, make sure to check out this French hot spot in the Dubai International Financial Centre. Perch yourself at LPM’s bar, and order a Tomatini – a savoury, peppery, signature cocktail that keeps the bartenders hopping all night long. Feeling peckish? Order the creamy burrata or rich cheesecake at the bar. Despite Dubai’s many renowned dining rooms, the affordable Pakistani cafeteria reigns as the city’s most famous restaurant. Every weekday at 5 o’clock in the morning, South Asian day labourers line up around the block for Ravi’s aloo paratha – deep-fried bread stuffed with potato. In the evening, though, Ravi’s is the haunt of local families and in-the-know foreigners. Try the lamb tikka masala, daal and paneer bhurji. Salt dominates the Dubai burger scene from its metallic Airstream trailer at Jumeirah’s Kite Beach. Slider-sized burgers are served on buttery buns with cheese and jalapeños; the peppers are optional but highly recommended. With five locations in Dubai, this café is credited for helping drive the homegrown organic food trend in the city. Grab a seat at one of the cozy tables, and enjoy a hearty breakfast of shakshouka – poached eggs in a rich tomato sauce with peppers, garlic and chili – served with a loaf of warm bread and olive oil. The smell of fresh popcorn permeates the Courtyard Playhouse, a tiny one-of-a-kind spot in Dubai. Hidden amid warehouses, this venue offers live stand-up comedy, improv, open mic and theatre performed by locals with a passion for comedy. Shows are usually free, but arrive early as seating is first-come, first-served. Set amid the lush greenery of the Park Hyatt’s courtyards, this spa pays close attention to detail. Book the signature Amara Herbal Ceremony, a massage that uses compresses of ginger, cinnamon and camphor powder to relax muscles, followed by a full-body scrub with sea salt and olive oil. Rinse off in the open-sky shower overlooking a private garden. Explore the Emirate’s extensive vegetation and wildlife on a guided kayak tour of the region’s mangroves, located 70 minutes outside the city. Keep your eyes peeled for close to 60 species of local birds, including flamingos and grey herons, as well as sea snakes and turtles. Take a three-hour road trip to Oman (reached via the Dahra UAE-Oman border crossing), and watch the landscape transform from flat and sandy to mountainous and rocky. Purchase your Omani visa at the border crossing, and stock up on gas and supplies before Ras Al Khaima. Once you reach Musandam Port, board a guided dhow boat; then explore the surrounding islands for swimming (and dolphin viewing if you’re lucky) before setting up at the beach campsite. Sleep under the stars, but don’t miss the boat when it returns for you the next morning. Skip yoga class and join Bounce’s Super Session for unlimited jumping on trampolines to the beat of an R&B soundtrack. This street of former warehouses is now a thriving arts community. Edgy contemporary galleries like Carbon 12 and Grey Noise regularly present exhibitions by international artists. Conceptual restaurants, such as Inked, offer experimental cooking and whimsical plating; think guanaja chocolate passing as soil. Located on a palm-shaped island off the coast of Dubai, this hotel provides the ultimate luxury experience, from private beach villas to lush gardens. Enjoy Mediterranean fare on the floating 101 Dining Lounge and Bar, reachable by boat or car, or book a table at Stay restaurant for a taste of meticulously crafted French flavours by acclaimed chef Yannick Alléno. Nestled in historic Al Fahidi, this hotel features an art gallery, open courtyards and breezy, white-walled rooms with mahogany trim. Managed by an American woman who has called Dubai home since 1993, the property also houses artist studios – watch for Halim Al-Karim and his purple beard – and a Middle-Eastern-inspired restaurant. This unassuming four-star hotel in the city centre, located minutes from the Mall of the Emirates, is ideal for business travellers. End your evening with a drink at Deck Se7en pool bar for nighttime views of the futuristic Burj Al Arab. Housed inside the world’s tallest building, this 160-room property is the first hotel by fashion designer Giorgio Armani. From custom-made furniture and marble accents to a luxury spa and a team of dedicated staff, there are many reasons why Armani is considered one of the most extravagant hotels in the world. Recognized for its award-winning restaurants, this five-star hotel features spacious rooms with views of Dubai Creek, a palm-tree-lined swimming pool, a lavish spa and an 18-hole golf course. Set sail on a glamorous yacht with Sea Hunters Dubai, the hotel’s private cruise company. Stay in the heart of the action at this boutique hotel, which offers spacious rooms, complete with rain showers, plus a 24-hour gym and laundry service. Take a peek at the various contemporary and street-art installations found throughout the property. Follow the terminal signs to the official taxi rank. (Fares start at AED20.) The Dubai Metro Red Line takes you directly into the city and costs a maximum of AED15. Taxis can be tough to find between 8:30 and 9:30 a.m. and between 4 and 6:30 p.m. Hotels, metro stations and the main roads in Downtown, JBR, the Marina and Media City are safe bets. (Taxis for women are marked with a pink roof.) Bring a map or detailed directions if you are going to a recently developed area, such as Business Bay, Al Quoz or Jumeirah Village Circle. The most popular options to get around, these two car services charge only a few dirhams more than regular taxis and offer competitive promotional rates. Uber is more reliable in terms of arrival times, while Careem offers more discounts. The tram services the south end of the city with 11 stops running from Jumeirah Beach Residence to Knowledge Village. A general public ticket costs AED3, while the gold first-class ticket costs AED6. Buy tickets at any metro or tram station. Bus stations abound in Dubai, but they are best to avoid unless you are confident of your destination or only travelling a short distance. Use your NOL card for bus fare. A low-rise take on the soaring city. In any other city, a humble working-class neighbourhood like Satwa would hardly interest foreign travellers. 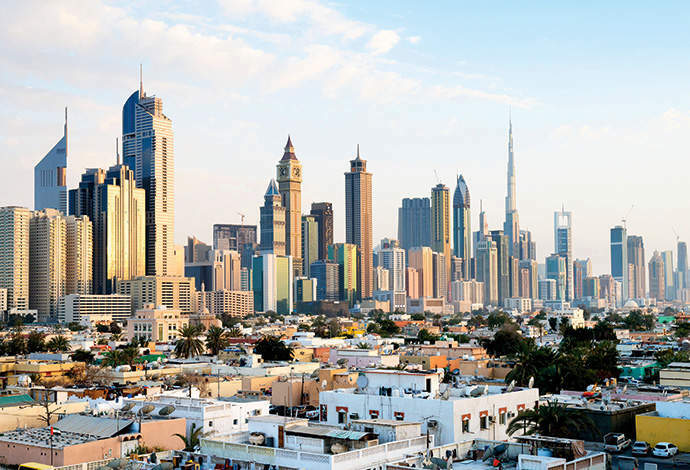 But in Dubai, famed for its glittering wealth and architectural bombast, Satwa is remarkable for its difference. “This is the antithesis of the new Dubai,” filmmaker Mahmoud Kaabour tells me as we walk through the district one evening. A few years ago, Kaabour co-wrote and produced a multimedia project, including a film, called Satwa Stories, highlighting the pleasures of the neighbourhood. “Dubai is successful internationally because it stands out, but once you’re on the inside it becomes a little numbing. You’re always having your beer in a five-star hotel,” Kaabour says. “Suddenly, when you’re in Satwa, a different part of your brain starts functioning.” Satwa’s relative smallness and hidden simplicity reminds you that a human heart beats inside the skyscraping city. Satwa does not evoke Dubai’s past – at least not the romantic Arab history of wind towers, falconers and pearl divers as recreated in the museums here. And it’s likely not a place of the future, either. While the 2008 global financial crisis stalled construction of a grand $95-billion project that would have wiped out the entire neighbourhood, last year a block of old villas was bulldozed to make way for a shiny new shopping district. Kaabour fears more demolition is coming. But in the meantime, Satwa represents Dubai in the present tense. Today’s Dubai relies on the labour of the South Asian, Iranian and Filipino immigrants who work long hours in the shops here. “It’s on these streets that we Dubaians get services we simply can’t get anywhere else,” Kaabour says. This is where businessmen get their pants hemmed, shoes repaired, car windows tinted and keys cut – even the high-tech car keys that dealerships insist cannot be reproduced. Having no such workaday errands to run, I’m content to sample a greasy paper-wrapped samosa from Najood Sweets and Restaurant. I browse the second-hand books at Book World, where the anarchically stacked shelves would give a librarian fits, and I walk past an Indian barber who would cut my hair, shave my face and give me a neck-cracking “massage” for about five bucks. And while I don’t need the fungus removed from any old VHS or Betamax tapes, I feel a nostalgic comfort seeing a storefront offering the service. After dark, and just before Satwa’s Filipino residents gather to shoot hoops at the Jafiliya Basketball Court, Kaabour leads me to Ravi Palace. All visits to Satwa eventually end up here. Despite Dubai’s many renowned dining rooms, the affordable Pakistani cafeteria reigns as the city’s most famous restaurant. Kaabour tells me that every weekday at 5 o’clock in the morning, South Asian day labourers line up around the block for Ravi’s aloo paratha – deep-fried bread stuffed with potato that will tide them over until the midday meal. In the evening, though, Ravi’s is the haunt of local families and in-the-know foreigners. Kaabour and I sit down and order more lamb tikka masala, daal and paneer bhurji than we can finish. Our entire meal costs less than you would pay for a single mojito at the sort of shimmering downtown hotel that may one day rise in Ravi’s place. I glance over my shoulder at the skyscrapers hovering over Satwa with their impending inevitability, and recall a few lines from Satwa Stories: “The towers and their unstoppable velocity. Faster than a speeding bullet. Looming. Moving. Never stopping for a single breath.” But there is still time. Here and now, I take a deep breath.